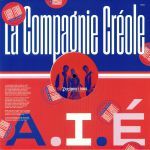 Review: "A.I.E" is arguably one of the most famous tracks by French Guinean band "La Compagnie Creole". While the 1987 original version was a typically joyous chunk of tropical, synth-heavy zouk, it's the lesser-known Larry Levan remixes - commissioned and released by Island Records America in 1988 - that are being reissued here. Levan's bustling "LL Club Mix" can be found on the A-side. It's a cheery affair, with the band's jangling guitars, strong vocals and bubbly synths being joined by elongated organ chords and snappy, club-ready machine drums. Arguably even better is Levan's chant-a-long flipside dub, which naturally gives more prominence to delay-laden drums, a killer zouk bassline and the sustained organ chords.